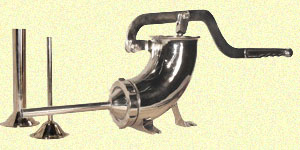 This sausage stuffer is made of stainless steel and has a 5 inch diameter throat to fit a full 5 lbs. of meat into the tube. Stuffer has 3 stainless steel funnels, 3/8", 3/4" and 1 1/4" sizes, so you can make anything from sausage to snack sticks. Plunger has a rubber gasket to prevent leakage. Mounts easily to your countertop or tabletop.